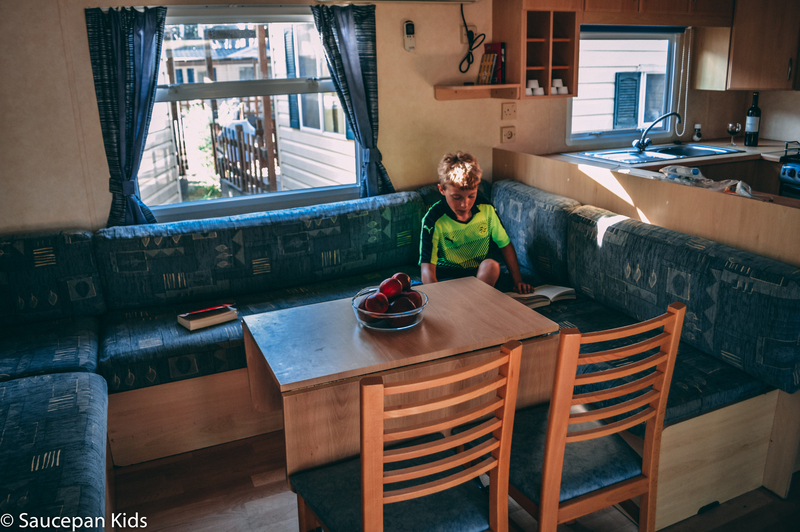 We’ve long been fans of family campsite holidays and have travelled many times with Canvas Holidays in the past, both before the children came along and with them. 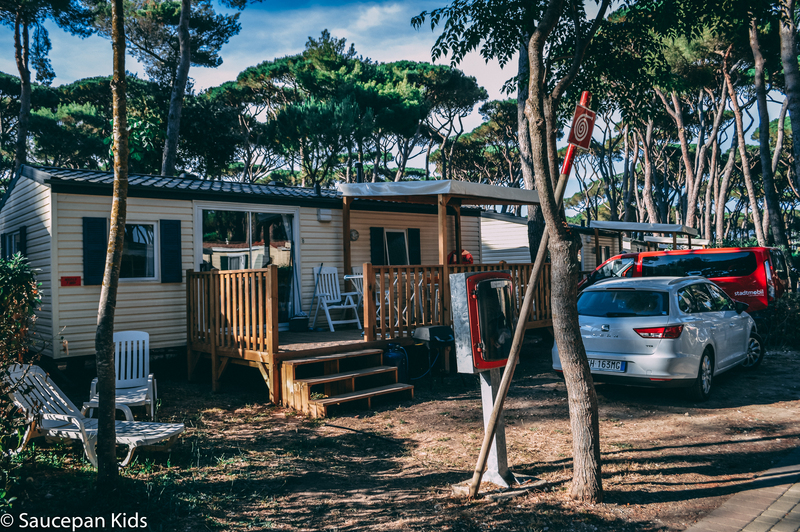 Up until this year we have only stayed in French campsites however after our amazing trip to Italy last year we wanted to go back, and this time wanted to experience an Italian campsite. After narrowing down this year’s Italy trip to Tuscany we did our usual exhaustive research, looking at many different campsites and companies and settled on Parc Albatros and Canvas Holidays. 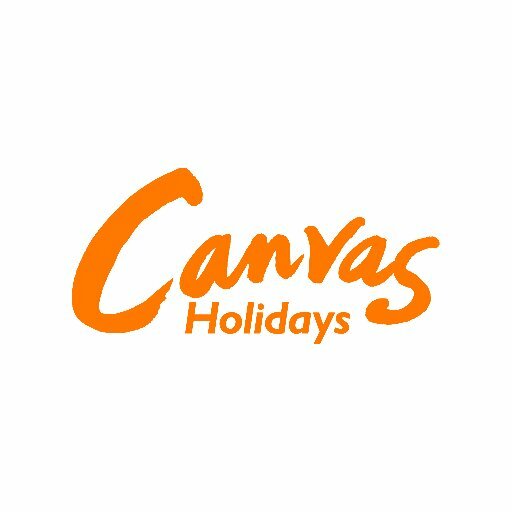 As I mentioned above we have stayed with Canvas Holidays many times before and had always found them to have an excellent level of service. They also seemed to be the best value this time round, and, as we have been a number of times before we could avail of their loyalty discount – a not to be sniffed at 5%. 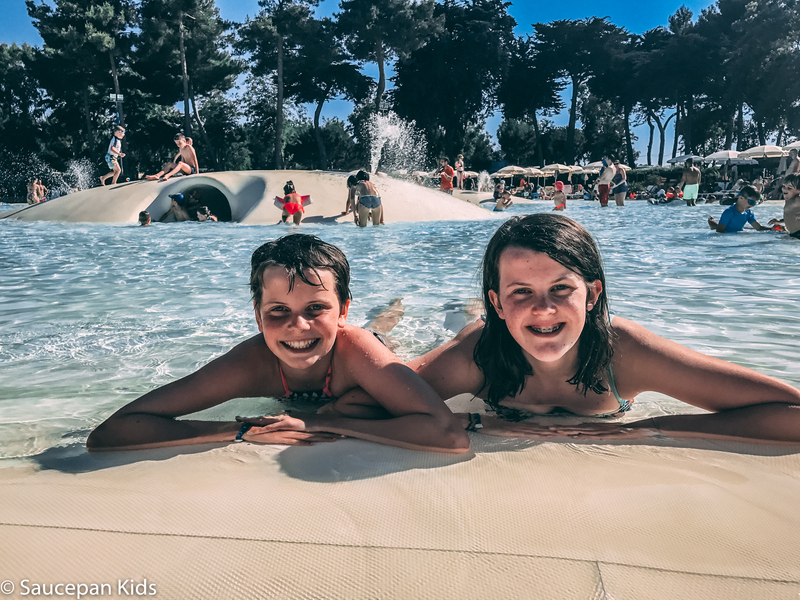 We chose Parc Albatros because it is by the coast, only just over an hour from Pisa airport, close to towns and attractions we were keen on visiting and also seemed to have the facilities that we thought would keep the kids happy. We read it was a large site, we normally prefer a smaller site, however when we arrived the true scale of it became apparent. It is more camping village than camping site. This being said, the campsite is well maintained, all of the roads were nicely paved and the plots are well laid out so it never feels crowded with plots practically on top of each other like other sites we’ve stayed at. When we arrived in June 2017, the site was rolling out its new check in process in the large reception area which felt something akin to a shoe shop queue – take a number for your company and wait…and wait…and wait. As this was new the staff didn’t seem to know quite how to manage it and not only was it mildly chaotic and took over an hour and a half, the couriers also didn’t stick to the numbering system so families with arriving after us were, rather frustratingly, dealt with before us. 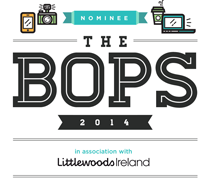 This is a far cry from the usual laid back, relaxed and friendly check in we are used to with Canvas on other sites. In fairness to Canvas, they are at the mercy of the site who clearly impose this system so they have no choice and I’m sure (hopefully) the staff have, by now, got to grips with the process and it is much easier. Another negative was the lack of a Canvas courier tent. At other sites we have stayed at there would be a tent where we know we could find couriers at certain times of the day. They would also have games, toys and books that could be borrowed which is very handy for those of us flying with limited luggage space. This may again be due to campsite regulations but we did miss it, the only way to get in contact with the couriers was via mobile phone and we didn’t see them at all after the first day. 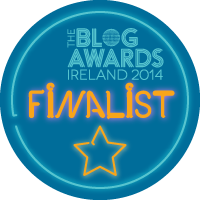 We, the adults, were rather nervous about this aspect of the holiday. We had just spent the last week in two amazing luxury Tuscan villas (Villa le Silerchie and Villa le Croci) so the equation of confined space plus three children (aged 14, 12 and 12) might prove to be rather stress inducing. We had booked a Select Plus 3-bed mobile home which is around 38 square metres, sleeps up to 8 and, as the name suggests, has 3 bedrooms – a double, a twin and bunk. None of the rooms are what you would call spacious however, at the end of the day, you only sleep in them (er… at the end of the day) so it really doesn’t matter. We had wanted to try out one of the new, more up-market, Moda mobile homes but when we booked in January they had already been sold out, so if you do want one of these I would recommend you book early. Aside from the bedrooms, this mobile had one bathroom with shower, a fairly decent sized kitchen/living/dining room and, most importantly of all, air conditioning. This is an absolute must in Italy in the summer. Even in June we experienced temperatures of 35c and to be able to come back from the beach, pool or day trip, turn on the aircon and enjoy the blast of cold air was wonderful. The kitchen was fairly well appointed and we were able to self-cater comfortably. We found it odd that there was no coffee making facilities until, on the afternoon of our second day, we returned from the beach to find a cafetiere sat on our outside table. Fair play to the Canvas reps for remembering and leaving us one but rather odd it wasn’t there at arrival. This was so useful I’m giving it its own sub-heading. In other sites, whilst we might have had decking, we’ve only had a parasol to provide shade. With a large family this doesn’t provide enough shade and one or more of us are left sitting uncomfortably in the sun. The covered decking with this mobile home was huge, providing more than enough cover for all of us at all times of the day. It really made meal times much more enjoyable and the intense Italian sun much more bearable. Basically, if you felt so inclined, you never have to leave the campsite. It can provide the less adventurous traveller with everything they need for a holiday. There is a very large, well stocked supermarket, a pharmacy, a bookshop, a souvenir/clothing/beach shop, a bar with lots of outside seating (though in the evening it could still be difficult to find a seat due to the entertainment), two restaurants, a take-away, a (brilliant) gelataria and laundrette. There’s a market that visits the campsite twice a week which sells everything from cheese to leather goods. The campsite is so large, there’s even a small train that potters about the campsite to ship families about. We ate in both restaurants on site, one is a bistro where we all enjoyed really good quality homemade burgers and drinks (mineral water for kids and wine for parents) which cost €80 for five of us. Too pricey for everyday but a lovely treat. The other restaurant on site, Da’ Alfredo’s, was a more up-market affair, again with good food and not much more expensive than the bistro. The on-site take away always had a queue of people waiting for freshly cooked pizzas. We were lucky, our plot was close enough to be able to walk comfortably to the pools and shops but far enough away that we weren’t really disturbed by the noise from the nightly entertainment in the open bar. 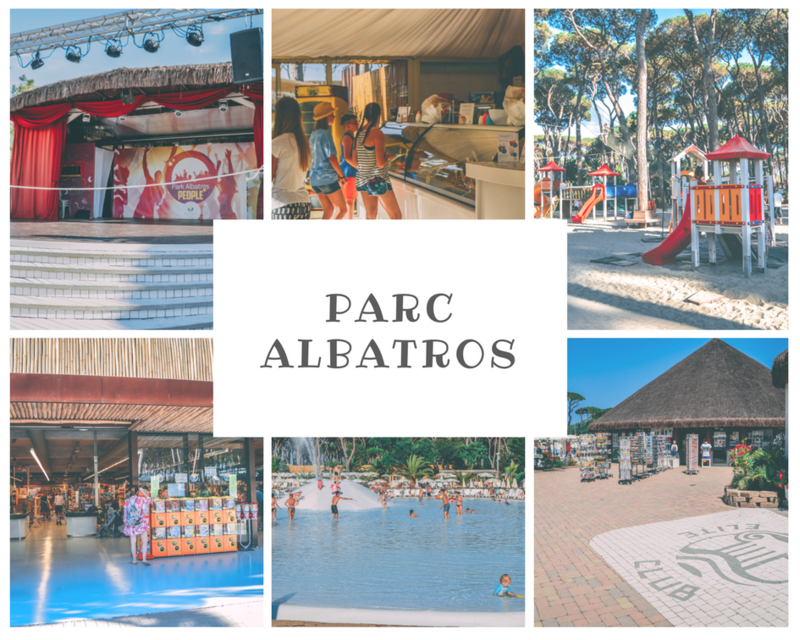 Parc Albatros spoils you for choice with pools – there are five of them including an olympic sized one and shallow, soft-floored, kiddy-friendly pools with slides and ‘dunes’. One of the pools even has a cover just in case it starts raining, which I can’t imagine happening all that often! The pools were open from 9am to 7pm and they were quite strict about people leaving towels on loungers. There are plenty of lounging areas along with a bar and another restaurant where you can grab a drink over-looking the pools – perfect for parents with older kids! Thrill-seekers need not apply however. There are no fast or exciting slides but, if you are looking for more excitement in your pools, the local area does have you covered with two Aqua Village water parks close by. Quite simply, there is absolutely loads of stuff to keep kids of all ages entertained day and night. In addition to the swimming pools there is a large playground and an arcade room with VR headsets and PlayStations for hire. On checking in we were advised to visit the information centre in the park and get the ‘animation programme’ of kids camps. I’ve never seen a programme like it and it was all free. Kids could do everyday from table tennis, dance fitness, DJ lessons, soccer (which was a free shuttle bus to the next door campsite), water polo, water basket to name just a few. There was a separate programme everyday for kids over 16 and also for adults too, like aqua aerobics and yoga. If you are prepared to spend a bit of money the choice of activities is widened further with the addition of bike, electric bike and go-kart hire, crazy golf and a jungle tree top walk with zip-line. The zip-line cost €18 for the three kids to have a go which I felt was good value as it took them quite a while to complete the course. The go-kart hire was a big hit too. Check out our Parc Albatros video review to see more. Whilst, as I said above, you could stay on the site for the duration of your stay, that is not for us, we like to get out and about and see the wider sights and take in the culture of the surrounding area. The nearest beach is only a five minute walk away but the road is narrow with no pavement and, in our opinion, rather dangerous made more so by some of the Italian approaches to driving. We also heard that this beach was rather stoney so we headed in the car to some of the other near-by beaches. Our favourite was Barratti which is a five minute drive away, large, sandy and safe for swimming. Like most of the local beaches you have to pay for parking and you have the choice of the free area or paid sections of beach where you are provided with a sun umbrella and loungers. 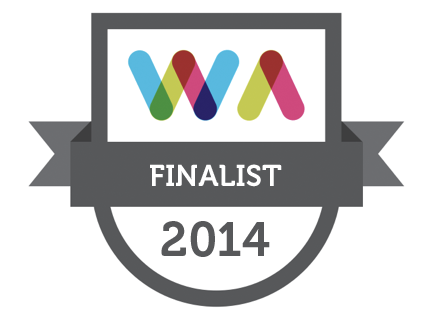 The Canvas couriers also recommended ‘The White Beach’ at Vada which we checked out when we were up that way. It’s a very strange beach as the sand is white due to the fact that there is a factory just inland that manufacturers bicarbonate of soda and the by-products are pumped into the sea which turns the sand white and subsequently the water is a very vibrant blue which makes it feel like you’re in the Caribbean. It is supposedly completely safe, however the water is murky and the sand feels likes wet cement and you can’t get away from the fact that this is not a natural phenomenon but one caused by chemicals! Definitely worth visiting for the curiosity factor alone. 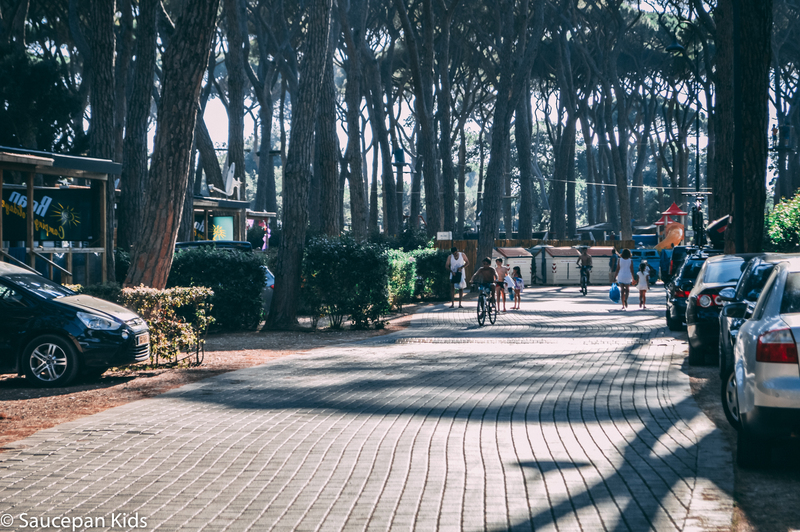 If you don’t have a car but would like to spend an evening away from the campsite, there’s a free shuttle bus (from 7pm) that will take you to the nearby town of San Vincenzo. 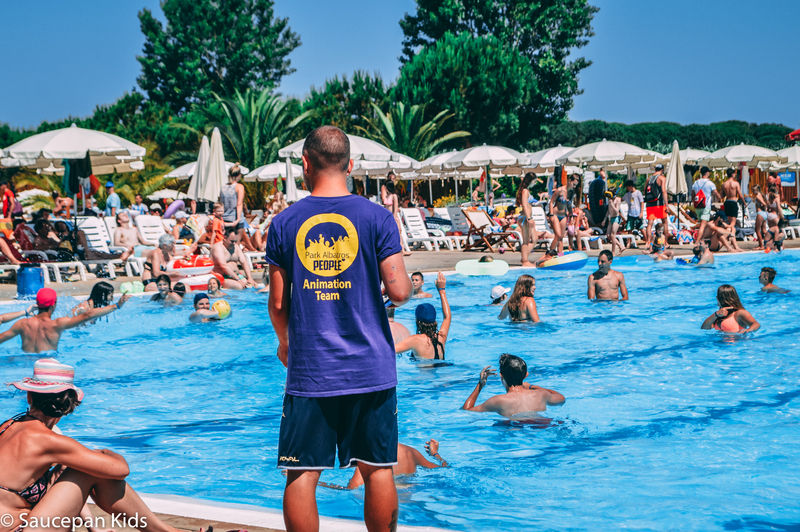 The campsite even organise day trips to Florence (on Wednesdays) and Elba Island (Tuesdays and Wednesdays) at an additional charge of around €44 for adults and €39 for children. There are many beautiful and fascinating Tuscan towns and villages which we would highly recommend visiting. 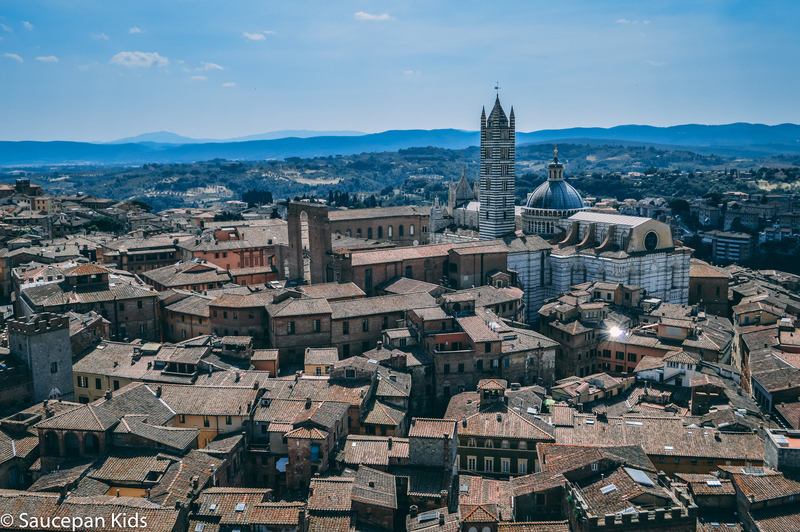 The famous walled city of Siena is less than two hours drive away and well worth the trip for its architecture, views and famous shell-shaped Piazza Del Campo where the twice-a-year horse race takes place. Much closer to Park Albatros, less than 20 minutes drive, was probably our favourite find, Populonia. Dating back to Etruscan times, it is a small, coastal, walled hill-top village which is a wonderful place to spend an evening watching the sun setting. 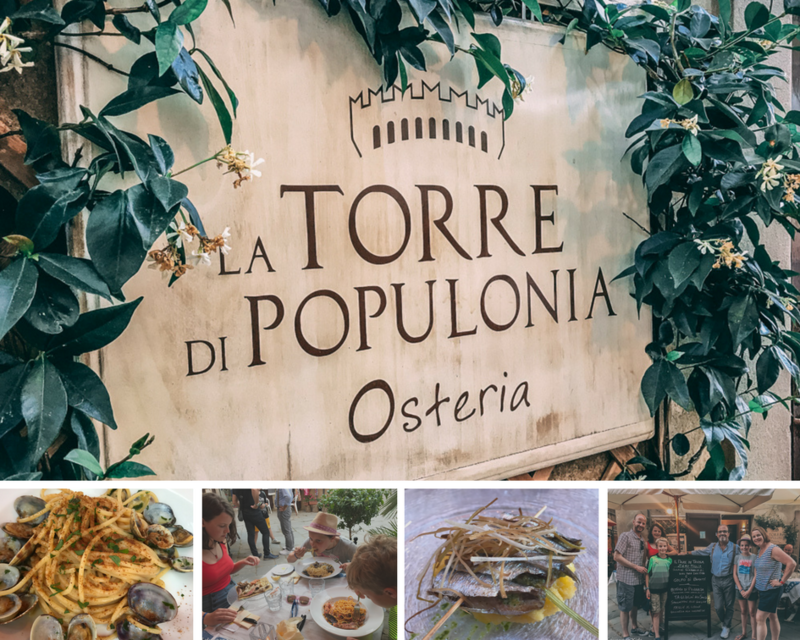 In Populonia we also found probably our favourite restaurant to date in Italy – Osteria La Torre Di Populonia. This small restaurant, run by a charming and friendly husband and wife team who had previously run restaurants in Rome, specialised in local seafood and homemade pasta which were simply amazing. They explained about the wine their friend produces and also about the olive oil they served which was produced a few miles down the road. After our visits to see parmesan, parma ham and balsamic vinegar being produced last year we wanted to visit an olive oil producer this time around so the next day we phoned, arranged a tour for a couple of days later. If you are there I would highly recommend a visit, the surroundings are beautiful and the wine and olive oil superb. So much so in fact we order a couple of cases which were delivered to Sligo shortly after our return. 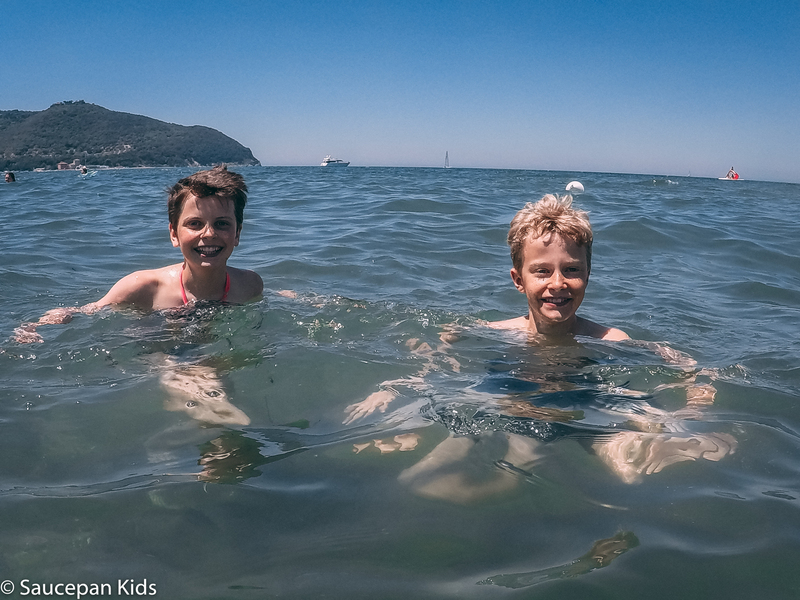 This is just a small selection of what we did and you can read more about our favourite family days out in Tuscany in this blog post. So, what are our overall thoughts and would we recommend Park Albatros and Canvas Holidays? 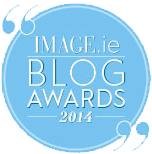 With regard to the site, yes we would highly recommend it from a family perspective. James and I personally would prefer a smaller, quieter site and if we were travelling without the kids we wouldn’t choose to stay there. However, as with lots of things, the children put a different perspective on things and bring their own requirements. There are lots of varied attractions to keep them entertained and they loved having the feeling of freedom of wandering off without us both during the day and in the evenings which they simply weren’t able to do in the villas. This was also nice for us as it gave us some relaxing (wine – which was pleasantly cheap at the campsite supermarket) time. 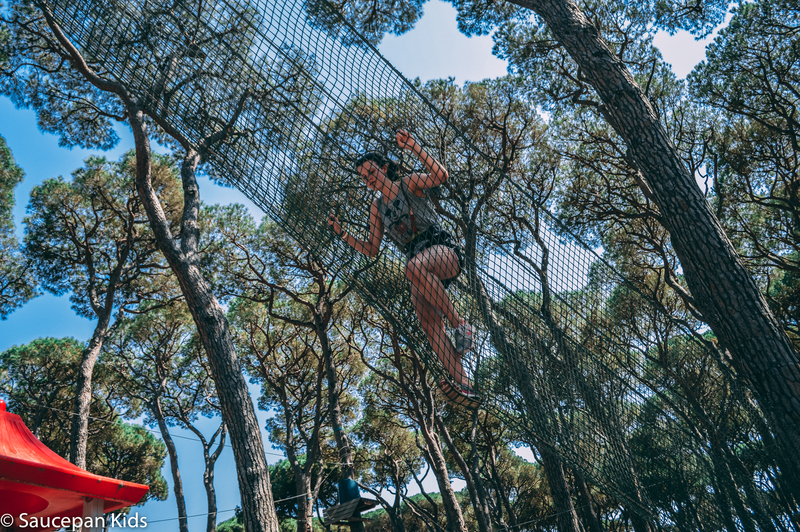 Even if your children are much younger and can’t disappear off on their own, there is plenty to entertain them at Park Albatros. How about Canvas – as I said at the start we have stayed with them many times before over the last 20 years so do have a bit of a soft spot for them. This time there were a few disappointments as I discussed earlier with the check-in, we missed the couriers’ tent and lack of coffee making facilities at first. The first two points can be put down to site related issues and the latter was identified without us asking which is a positive. 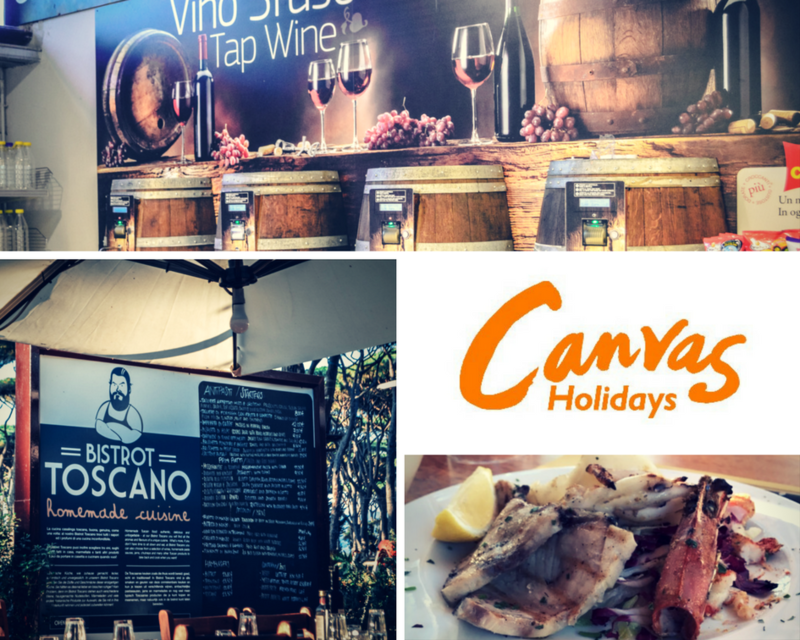 On the whole though the booking process was easy, Canvas were the best value we could find, the couriers were nice and helpful when we did need them and the mobile home was well appointed and had a good location on the site. 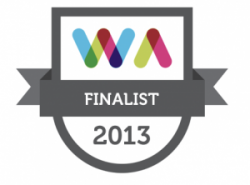 So, yes, we still would recommend Canvas as we have done over the years to our family, friends and anyone else who will listen. 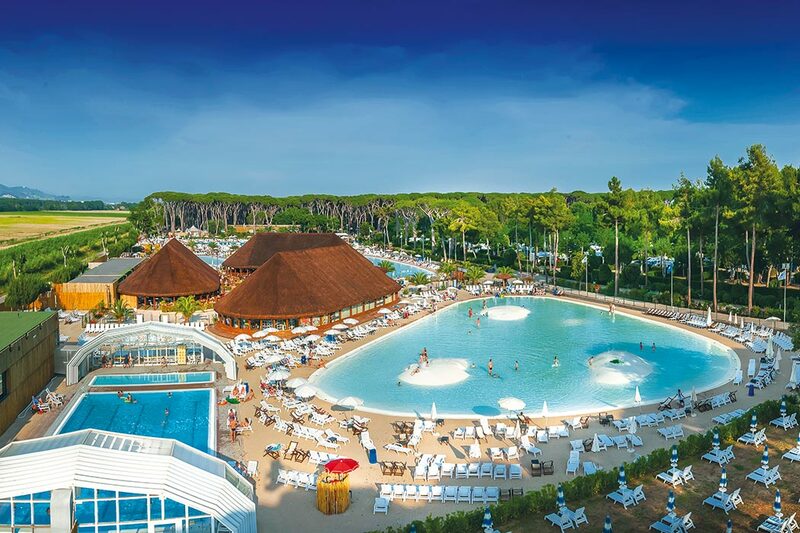 If you are looking for a good value, fun family holiday in beautiful Tuscany then you won’t find much better than Park Albatros with Canvas Holidays. 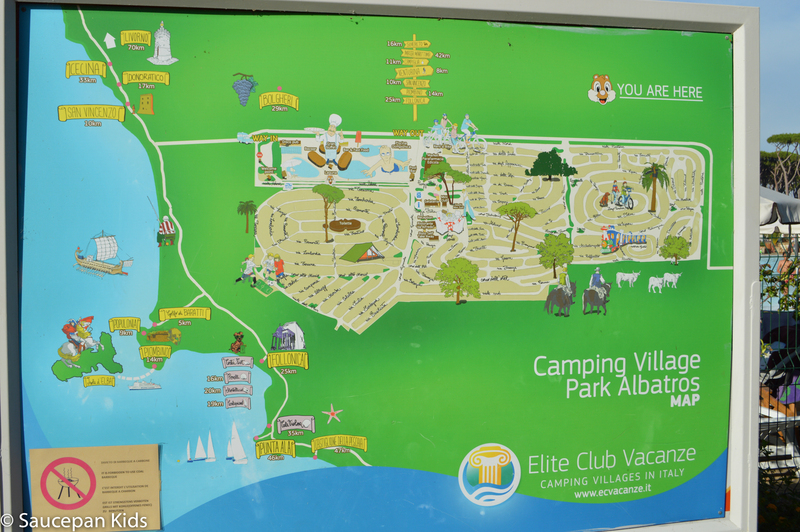 Disclaimer – We booked and paid for our visit to Parc Albatros with Canvas Holidays in full however we were asked to try out some of the facilities on site by Canvas Holidays. All photos and opinions are 100% honest and our own.